We’ve selected what we feel are the key examples of French Theatre Buildings. We cover completed French buildings, new building designs, architectural exhibitions and design competitions across France. The focus is on contemporary Arts buildings. This French theatre has 971 seats plus a flexible auditorium of 400 seats, a drama school, a dance school and a restaurant. The Front de Maine theatre is a major building for the town and its region. 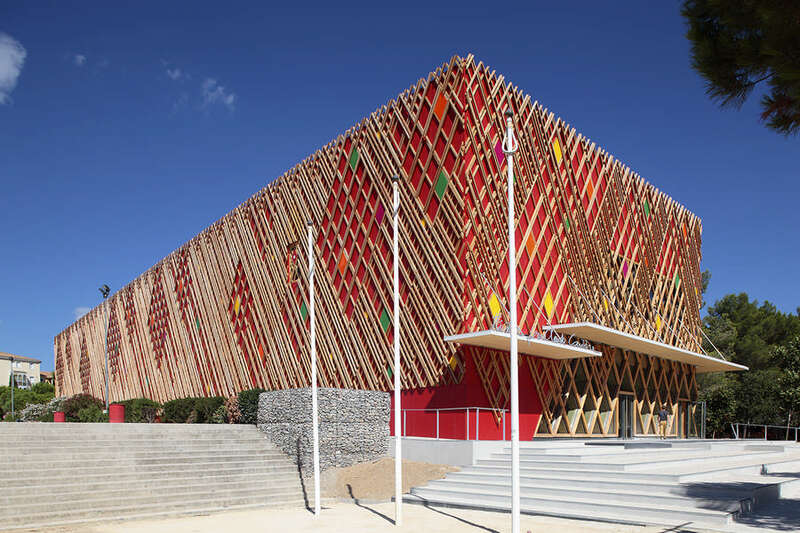 Developed around the “creation, training, urban animation” trend, the theatre’s architecture enhances urbanity and ensures the link between the town, performance areas and the two schools. The architects conceived the new Bateau Feu theatre in Dunkirk both as an open urban venue – which is welcoming by the diversity of the complementary programme of events and activities that it provides and their strategic orientation in the urban space – and as a structuring civic building and arts amenity located on the Place du Général de Gaulle square. In Montreuil, located northeast of the urban center of Paris, a master plan has in recent years been realized for the regeneration of the urban center by Alvaro Siza. The project, with the theater at its heart, shows the hill of the site : the buildings like the fingers of a hand reveal the slope and increase the perspectives.